KoopaTV: Bayonetta On Switch; Bayonetta Off Smash? By LUDWIG VON KOOPA - She's out of control, and now on a Nintendo Switch near you. Source is PG_Spike of Panda Global Stats. Meanwhile, today Bayonetta and Bayonetta 2 were re-released (or re-re-released), now for the Nintendo Switch. A lot of Super Smash Bros. fans were quite unhappy when Nintendo announced Bayonetta, Bayonetta 2, and the new and upcoming Bayonetta 3 at The Game Awards 2017 (I was upset just having to watch The Game Awards at all). Many were mad ever since Bayonetta won The Smash Ballot via an asterisk, and then were mad when she finally became purchasable for $5.99, which they saw as pay-to-win. Less than a month later, the developers released a balance patch targeted at nerfing Bayonetta. And yet... the Bayonetta metagame has furthered much farther than I anticipated after her release, back when I thought Ryu had more combo potential than Bayonetta. Now Bayonetta is unanimously considered the best character in the game. People want her banned, and they personally hate her, to the point where they are upset that her series is staying alive. I'll get into what exactly makes Bayonetta so powerful, but before I do, I suggest you read my 2014 article, “Reminder: Don't Hate on Meta Knight!” Before Super Smash Bros. 4 came out, people developed a personal hatred for Meta Knight because he was the best character in Super Smash Bros. Brawl and tournaments were dominated by him. Many called for Meta Knight to be banned from competitive play. The point of that article is that it was legitimate to resent what Meta Knight had done to the commpetitive metagame, but not a good idea to hate Meta Knight within the context of the Kirby series. Same lesson applies to Bayonetta. It's great that the Nintendo Switch is going to have all three Bayonetta games once Bayonetta 3 is made and released! The fact that Bayonetta is so amazing in Super Smash Bros. while being very true to her character in her own franchise should get you excited to play her series. 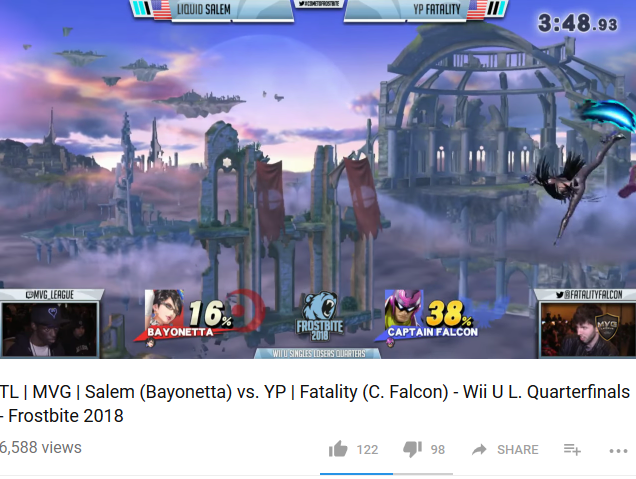 You can tell if Bayonetta wins a Super Smash Bros. match on a YouTube video based on if there a bunch of dislikes. Right now, Bayonetta has a triple jump (she's not supposed to, but it was never fixed via patch), an immaculate combo game that allows her to 0-to-death people off the top or the sides, or at least get upwards of 70% damage off one hit, Bats Within (which lets her escape combos and hits that no other character can), Witch Time (the best “counter” in the game), unpredictable landing options, and an immunity to being edge-guarded. Plus, she can apply pressure from afar with Bullet Arts and Bullet Climax as projectiles. She has TWO Side-B attacks. The risk of doing a bunch of attacks in the air, the increased landing lag, is sort of irrelevant if you're knocking your opponent off somewhere so they can't hit you, or you use your intense aerial movement to just grab the ledge. As Hungrybox says, Bayonetta is in the same game with a very weak Jigglypuff. There's something wrong there from a balance perspective. Bayonetta just has so many advantages more than the other characters. Other characters may have one or two special qualities that make them stand-out, but Bayonetta has many. She can easily overwhelm her opponents and make them feel hopeless. The best you can do is try to do what is called Smash Directional Influence out of her combos, but a skilled Bayonetta player can react appropriately to that and keep destroying you anyway. It puts people off that the final DLC characters (besides Corrin) are the best characters in the game. Pay-to-win is a bad feeling — this afterthought invader is suddenly upending the entire competitive scene, and tournament organisers won't ban her, and the game creators have stopped their patches a long time ago. Currently in the Super Smash Bros. 4 community, people are debating how toxic Bayonetta is making the competitive experience, and if Bayonetta is threatening the game's chances of being a successful eSport. The viewership numbers literally drop-off if there is a Bayonetta on-screen; it's more noticeable when there are two fighting one another. I admit that I didn't watch the Bayonetta dittos that went on during Frostbite 2018 since I really wasn't interested in that. Bathroom breaks were more rewarding. Still, I don't hate Bayonetta as a character. And if I did, she'd probably punish me and lock me back in the dungeon. Ludwig is scared of crossing paths with Bayonetta. When he encounters Bayonetta, he hides behind Lucario, who might have a Fighting(-type) chance to win because Bayonetta tends to increase Lucario's aura. He doesn't support Bayonetta's banishment, believing that Custom Moves should be re-introduced back into tournament play as a way to buff non-Jigglypuff characters (Jigglypuff's custom moves are terrible) while not affecting the DLC characters. By the way, this article was written because Ludwig found it an important topic anyway, but it also answers a request KoopaTV has received about Bayonetta! You can and should submit your own requests on the Requests page. Bayonetta's tournament behaviour is becoming more and more untenable. I do not mind her much, but Bayonetta should probably be banned from the competitive scene if too many users abuse her moveset. Her cheap tactics really just ruin everyone else's shot of fairly winning. It's not abuse... it's use. Sakurai likely intended for the best character in the game to be the last for-pay DLC. 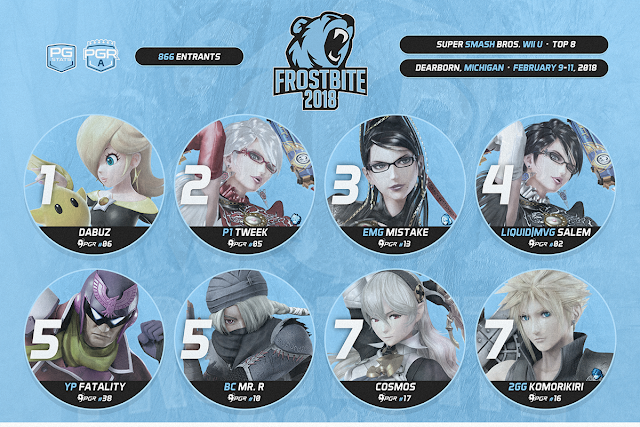 Despite whatever overtones you may read from this article, I don't think enough time has passed to conclusively determine that Bayonetta has completely killed the competitive scene. After all, Bayonetta users aren't actually winning all that many major tournaments, so she's clearly beatable.